The first defended settlement on Danebury Ring was created in the late sixth or early fifth century BC and came to an end, possibly a violent end, sometime around 100 BC or soon after. Four and a half centuries of occupation necessarily saw significant changes which have left their mark in the archaeological record. In order to begin to understand these changes and with them the social, economic and political dynamics of the community, it is essential to establish a chronology for the site. The most obvious place to start is with the rampart and ditches, where it might be reasonable to expect to find evidence of periodic redefence. With this in mind, in 1969, a section was cut through the main (inner) earthwork, the middle earthwork and the outer earthwork to clarify the outlines of the main sequence. Subsequent work on the rampart modified and amplified our under­ standing. The inner earthwork showed a number of constructional phases (images 01 to 05). Image 01 – Section through the main rampart (1969). The figure crouches on the original ground surface. In the foreground is the quarry from which material for the first rampart was gathered. The stages in rampart building can be clearly seen. The first rampart, built on the original ground surface, was fronted by an earth-filled box-structure of timber. At this stage there would have been a narrow berm between the front timber wall and the defensive ditch from which much of the material for the rampart had been derived. The timbers would probably have begun to rot within 20-30 years and since there is no evidence of their having been replaced it must be assumed that the later refurbishing of the rampart involved the cutting back of the rampart face to a steep slope continuous with a re-cut V-shaped ditch. Danebury Ring’s primary rampart, and its ditch, is designated rampart period 1. 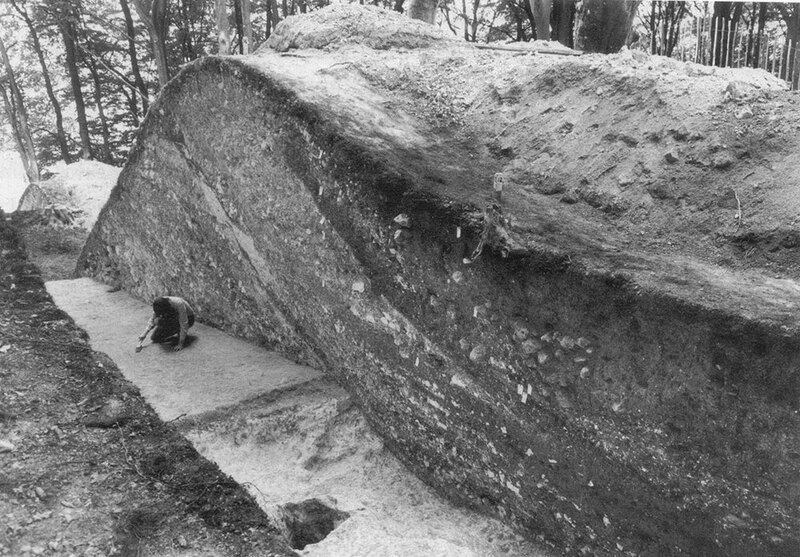 It was built in two stages, almost entirely of freshly quarried chalk rubble dug from the ditch, but was backed in places with tips of clayey soil, possibly the soil removed from along the ditch line and stockpiled inside the fort until the rampart core was complete. The back slope of the rampart had begun to compact and to weather when another layer of chalk rubble was thrown on it increasing its height by about half a metre. The material for this, period 2, extension came from a series of shallow, discontinuous quarry hollows inside the fort (Images 03 and 04). How long elapsed between the constructions of periods 1 and 2 is impossible to say but judging by the degree of weathering on the back of the first rampart it could have been as little as 50 years. The heightening may have been carried out when the original timbers had begun to rot and the earthwork began to collapse, but it hardly increased the defensive capabilities of the site and may have been little more than a symbolic act. Image 02 – Section through the main ditch and rampart, 1969. The further figure kneels on the original ground surface. Image 03 Shows the third phase removed showing the chalk coating added in period 2. Image 04 – Excavated to the slope of the period 1 rampart with segments of the tail removed. After some time, during which the back slope of rampart 2 weathered and a layer of turf formed on it, the rampart was again heightened. The southern defences, between the east and south-west gates, were not substantially altered, the addition amounting to only about 50cm (18in) of silt and chalk scraped up from inside the fort, but on the north and east sides the rampart was greatly increased in volume, the material being derived from a deep and almost continuous quarry 1Om (30ft) wide dug around the fort behind the tail of the refurbished rampart. The reason why this sector of the Danebury Ring rampart was so dramatically rebuilt may lie in the fact that in the early period (periods 1 and 2) the bank had been much slighter in this sector because the slope of the hill was steeper, thus affording better protection. In period 3 a desire to make the defences of equal strength around the entire circuit would have meant that much more material had to be dumped along the northern length to bulk up the rampart here to the volume of the rest. 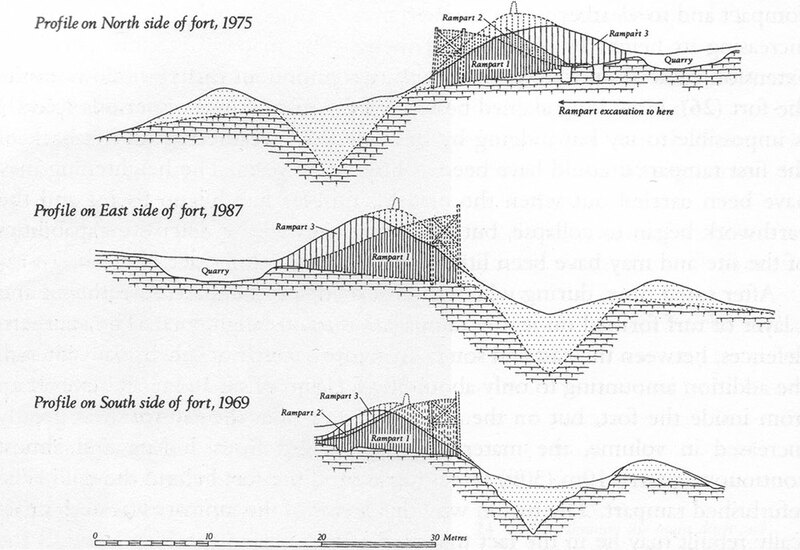 Image 05 – Sections through the rampart showing the differing profiles around the fort. It was probably as part of this period 3 reorganisation that the ditch was re-dug to a deep V-shaped profile, 11-12m (40ft) wide and 6m (20ft) deep, with its inner slope continuous with the sloping face of the rampart. The distance up the slope, from the bottom of the ditch to the top of the rampart, would have been about 16m (52ft) . It is not absolutely clear how the top of the rampart was treated, but judging by the number of large flint nodules found in the ditch fill and in the silts behind the rampart, the probability is that a breastwork of dry-built flint walling ran around the crest to give protection to defenders. Defences of this kind, with no wooden structure to rot, were comparatively easy to maintain, but the ditch would have silted as the result of natural weathering and had to be cleared out frequently, the spoil being dumped along the outer lip. Continuous clearing over a period of time led to the creation of a considerable bank of spoil nearly 2m (6ft) high and 7m (23ft) wide which, when sectioned, showed distinct tip lines separated by erosion surfaces, each representing a single clearing operation followed by a period of inactivity. In the past, banks of this kind have been called ‘counterscarps’, implying deliberate construction for military purposes but this is clearly not the case and the term is therefore inaccurate.